In theory, the digital transformation is long since underway everywhere, but in reality companies are struggling with it. If you want to break down silos and make processes transparent, exchange knowledge across disciplines and speed up idea development – in other words, to work in an agile way – you will find that ‘Working Out Loud’ provides an approach with the power to prepare us for the future of work. The key is: learning network competency. At Shell, IBM, Microsoft, Airbus, Bosch, Siemens, Daimler and BMW, to name but a few, employees started this on their own initiative. Every company that wants to have a future wants to implement the digital transformation. To this end, money is being invested in technologies and tools, developers are being hired and data is being collected. But the most important element, the cultural transformation in the company from the industrial age to digital work on a day-to-day basis, represents a major obstacle for many. It is not something that can be prescribed. Decrees from management such as ‘We now want to organise knowledge exchange within our social network. We want to become a learning organisation. We want to work in an agile way,’ prove futile. Who wants to change? And above all, how do we have to change in order to be successful in future? The famous recommendation ‘just do it’ has led to an astounding recipe for success in terms of mental transformation with the concept of ‘Working Out Loud’. Working out loud? That sounds like a form of blowing your own trumpet, but isn’t really to do with that at all. The term was coined by Bryce Williams, an IT consultant, in a 2010 blog post about the laborious introduction of social collaboration tools. John Stepper, at that time an IT specialist in New York, dealt with the issue, too. He used the term to develop a systematic, application-oriented method that helps people to share knowledge, exchange knowledge and learn together in everyday work with a wide variety of partners. These are all abilities that strengthen ‘network competency’. In 2015, he published a book of the same name, and in April 2016 he presented ‘Working Out Loud’ at the TEDxNavesink conference. That year he lost his job, but started working as a freelance WOL consultant shortly afterwards. His first project came from Germany via Katharina Krentz, Digital Collaboration & Chief Corporate Community Manager at Bosch. The Working Out Loud recipe for success comprises a fixed structure, 12 work steps and five components. The structure works like this: a work group of four or five people meets once a week for an hour over a three-month period. The meetings can take place virtually or in a nearby cafe. This is the WOL Circle. On workingoutloud.com there is a detailed Circle Guide – worksheets that describe and explain the tasks and suggest a time period – for each of the 12 meetings. Each meeting is dedicated to a guiding idea: ‘Sharpen your attention’, ‘Offer your first contributions’, ‘Make it personal’, ‘Become visible’, ‘Make a habit of it’ … These worksheets are made to be very practical, human and motivating. They are available in English, German and Portuguese. According to John Stepper, French, Dutch, Mandarin and Spanish are currently in development. These components make the paradigm shift in cooperation clear: there is no winner, there is no comparison, there is no knowledge for the sake of power, there is no right or wrong. It is about everyone having a goal, everyone wanting to learn, everyone being able to contribute something, learning from each other, coming up with ideas together and being able to develop ourselves mutually. The small circle supports individuals in reaching their goal, encourages, provides tips, inspires and gives further assistance. In our unclear present with its fast changes, those are workplace abilities that are needed to find solutions for the future. In this way, Bosch has implemented something that Bert Vries, IT Manager at CMS Netherlands, considers necessary. 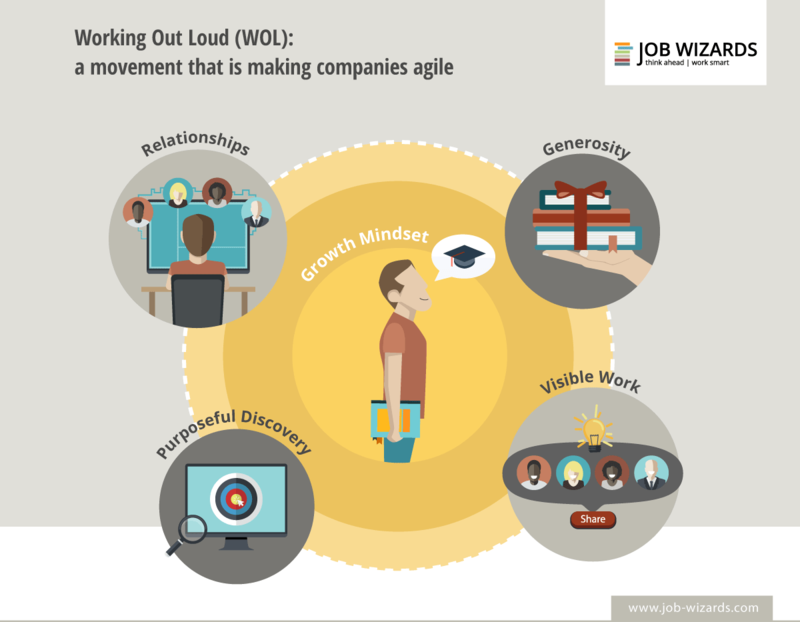 In 2015, he established the Working Out Loud Community of Practice (CoP) in the Netherlands, and thinks WOL should be an essential ability of every employee intended to develop and support companies. As far as he is concerned, it is proven that, in principle, WOL helps employees on a daily basis to focus on a goal and achieve it more quickly and easily. The advantages of WOL as a method for employee development within learning organisations are clear. It does not require much preparation or time, it is not expensive to implement and it is self-explanatory. It can be done repeatedly. It grasps employees on a personal level: with their self-determined goal. Regardless of how shy, sceptical, introverted or experienced you are, every meeting shows how small steps can have a big effect. Suddenly, other people’s ideas help an individual, contact can be made with an expert within the company who has a similar issue, or a solution is suggested by a colleague at a different location. This positive response to your own activity motivates you to work, strengthens self-belief and is enjoyable. For Andreas Schorn, WOL initiator at BMW, the most important change is that new ideas really do come to fruition faster via these new contacts and relationships at work, spanning sector and department boundaries, visibly in the Enterprise Social Network. This is how new knowledge can work. It is no use for knowledge to be formalised and lying dormant somewhere in a database; it only becomes productive as information, as part of an exchange, when it helps with a task. In his opinion, WOL establishes the cultural basis for an agile company. An interview with John Stepper, author of ‘Working Out Loud. For a Better Career and Life’, follows in part II. Among other things, we discuss how WOL is used by small and medium-sized enterprises, where WOL Circles go wrong and how best to get started yourself.